Tying fishing flies requires you to use knotting techniques that will enable the knots to remain secure. 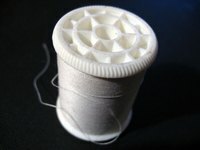 The nylon thread that is typically used to tie flies can sometimes be difficult to see in order to tie them properly. Understanding the turtle-knot, fly-tying method will allow you see the loops of the invisible thread more clearly as you tie. This enables you to successfully loop and tie the invisible thread to create your fishing flies. Thread a 12-inch piece of clear nylon thread onto a sewing needle. Hold the middle of the thread in your left hand, and the needle in your right hand. Create a loop in the middle of the thread, and hold the loop firmly in your left hand. Curl the bottom portion of the thread into a second loop, which will automatically fold over the first loop. Hook the end of the thread over the fold that was created, and pull the thread taut with the needle. The invisible thread will be effectively looped.